We know that the stability of the given closed loop system depends upon the location of the roots of the characteristics equation. That is the location of the closed loop poles. If we change some parameter of a system, then the location of closed loop pole changes in ‘s’ plane. The study of this locus (of moving pole in ‘s’ plane) because of variation of any parameter of the system is very important while designing any closed loop system. This movement of poles in ‘s’ plane is called as ‘Root Locus’. This method was invented by W.R. Evans in 1948. 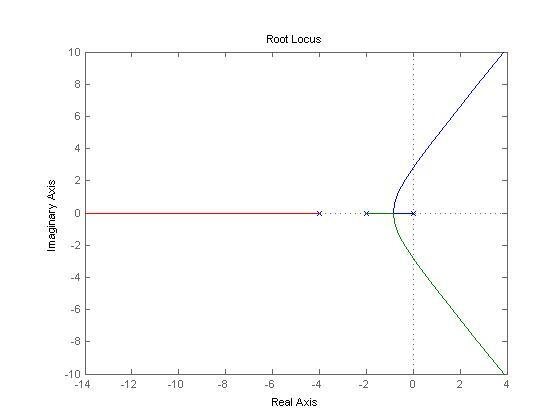 Root Locus is a simple graphical method for determining the roots of the characteristic equation. It can be drawn by varying the parameter (generally gain of the system but there are also other parameters that can be varied) from zero to infinity. Determine the open loop poles, zeros and a number of branches from given G(s)H(s). Draw the pole-zero plot and determine the region of real axis for which the root locus exists. 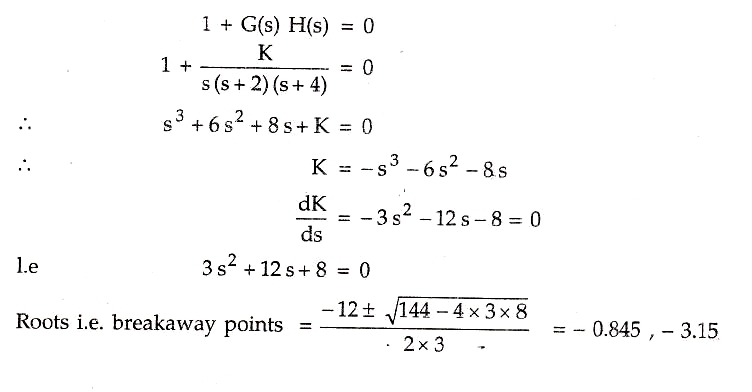 Also, determine the number of breakaway points (This will be explained while solving the problems). Calculate the angle of asymptotes. 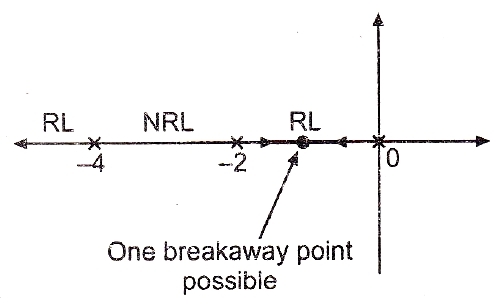 Calculate the breakaway points (if any). Calculate the intersection point of root locus with the imaginary axis. Calculate the angle of departure or angle of arrivals if any. From above steps draw the overall sketch of the root locus. Predict the stability and performance of the given system by the root locus. Question: For a unity feedback system, G(s) = K/[s(s+4)(s+2)]. Sketch the nature of root locus showing all details on it. Comment on the stability of the system. Given system is unity feedback system. Therefore H(s) = 1. Therefore G(s) H(s) = K/[s(s+4)(s+2)]. Poles = 0, -4, -2. Therefore P=3. Zeros = there are no zeros. Z=0. So all (P-Z=3) branches terminate at infinity. Step 2: Pole-zero plot and sections of the real axis. The pole-zero plot of the system is shown in the figure below. Here RL denotes Root Locus existence region and NRL denotes the non-existence region of root locus. These sections of real axis identified as a part of the root locus as to the right sum of poles and zeros is odd for those sections. Number of asymptotes = P-Z = 3. Therefore 3 asymptotes are approaching to infinity. Step 4: Centroid or Centre of asymptotes. 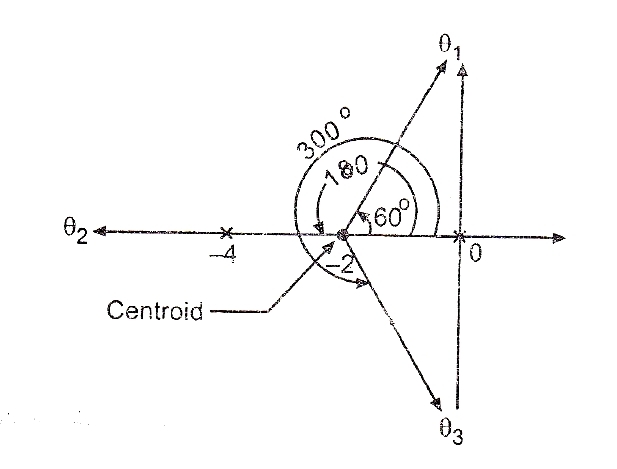 Asymptote touches real axis at a point called centroid. Branches will approach infinity along these lines which are asymptotes. For s = -3.15, K = -3.079 (Substituting in equation for K). But as there has to be breakaway point between’0’and ‘-2’, s = – 0.845 is a valid breakaway point. For s = -0.845 K = +3.079. As K is positive s = – 0.845 is valid breakaway point. Step 6: Intersection point with the imaginary axis. Intersection of root locus with imaginary axis is at ±j2.828 and corresponding value of K(marginal) = 48. Step 7: As there are no complex conjugate poles or zeros, no angles of departures or arrivals are required to be calculated. Step 8: The complete root locus is as shown in the figure below. For 0 < K < 48, all the roots are in left half of s-plane hence the system is absolutely stable. 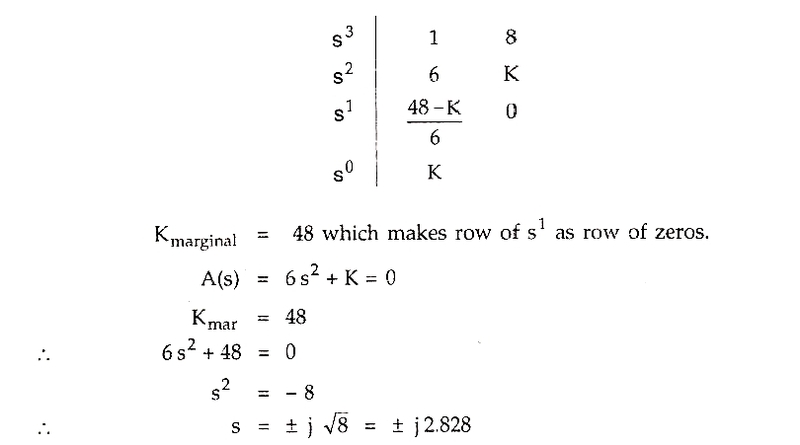 For K(marginal) = +48, a pair of dominant roots on imaginary axis with remaining root in left half. So the system is marginally stable oscillating at 2.82 rad/sec. For 48 < K < 8, dominant roots are located in right half of s-plane hence system is unstable. Stability is predicted by locations of dominant roots. Dominant roots are those which are located closest to the imaginary axis. How to draw bode plot in control system. Mason’s gain formula for determining the overall gain of the system (with example). Block diagram algebra (Block diagram reduction). Effects of addition of poles and zeros to closed loop transfer function. Addition of poles and zeros to the forward path transfer function. Study and plot unit step response of addition of pole and zero to the closed loop transfer function for a unity feedback system. Plot the response for four different values of poles and zeros. Comment on the effect of addition of poles and zeros to closed loop transfer function of a system. 1) As the pole moves towards the origin in s plane, the rise time increases and the maximum overshoot decreases, as far as the overshoot is concerned, adding a pole to the closed loop transfer function has just the opposite effect to that of adding a pole to forward path transfer function as discussed in the last article. 2) The addition of left half pole tends to slow down the system response. 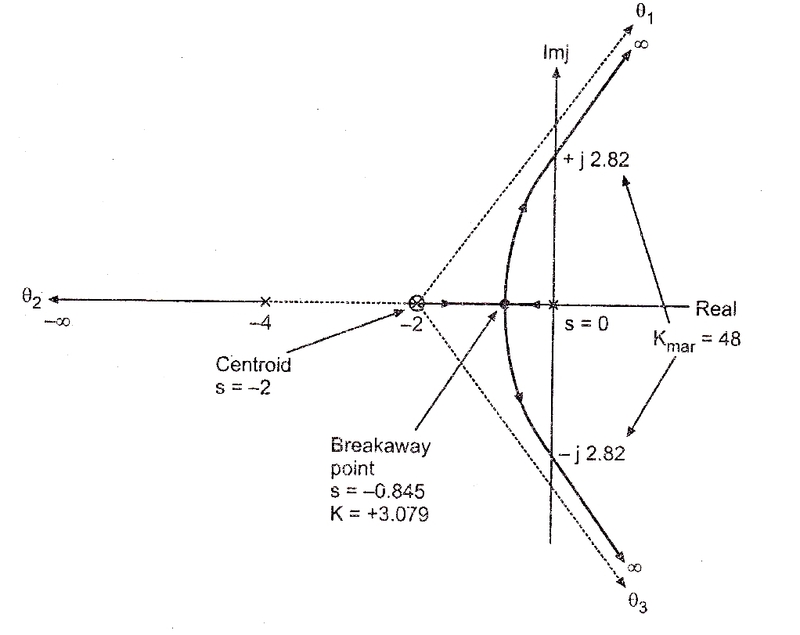 3) The effect of addition of pole becomes more pronounced as pole location drifts away from imaginary axis. 4) Addition of right half pole will make overall system response to be an unstable one. 1) Makes the system overall response faster. 2) Rise time, peak time, decreases but overshoot increases. 3) Addition of right half zeros means system response slower and system exhibits inverse response. Such systems are said to be non-minimum phase systems. Minimum phase system: The system which doesn’t have zeros in right half of s plane is said to be minimum phase system. Non-minimum phase system: If a transfer function has poles or zeros in right half of s plane then the system shows the non-minimum phase behavior. How to draw Root Locus of given transfer function with simple steps (including MATLAB example). To perform a block diagram reduction using MATLAB. Study and plot unit step response of addition of pole and zero to the forward path transfer function for a unity feedback system. Plot the response for four different values of poles and zeros. Comment on the effect of addition of poles and zeros to forward path transfer function of a system. 1) Unit step response of closed loop system when Wn=10, zeta=0.5, P=[1,5,10,20]. These responses show that addition of pole to forward path transfer function generally has the effect of increasing maximum overshoot of closed loop system. 2) As the pole moves closer to the origin in s plane, the maximum overshoot increases. 3) These responses also show that added pole increases rise time of step response. 1) Addition of forward path zeros to left hand side of s plane increases speed of output response but a large overshoot may result if the zero is sufficiently lose to 0. 2) The order of system does not increase with addition of zero to forward path transfer function. 3) The zero in right half of s plane retards the system and produces an overshoot. The percentage overshoot decreases as the zero moves along positive real axis towards infinity. Again system oscillates for a large time. Question: A unity control feedback system has G(s) =80/s(s+2)(s+20). Draw the bode plot. Determine the gain margin and phase margin. Also determine gain cross-over frequency and phase cross-over frequency. 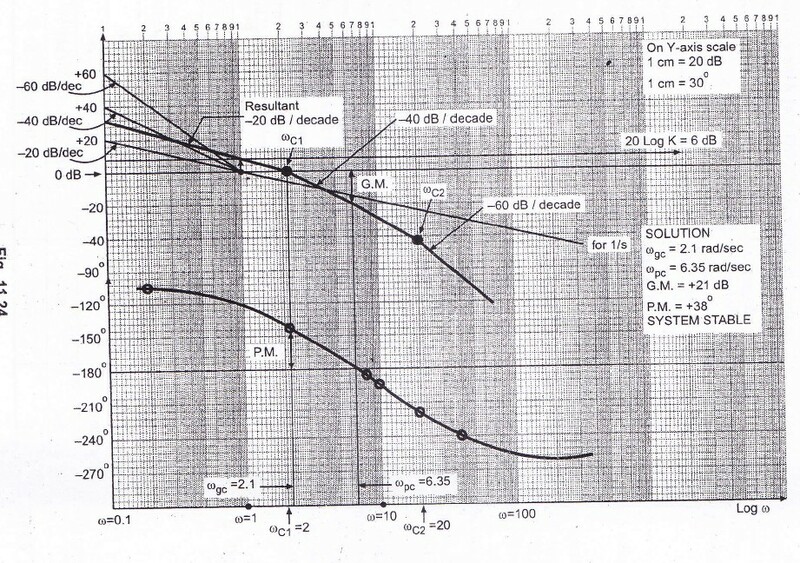 Comment on the system stability using this Bode plot. 2) One pole is at origin. (Because there is ‘s’ in the denominator). 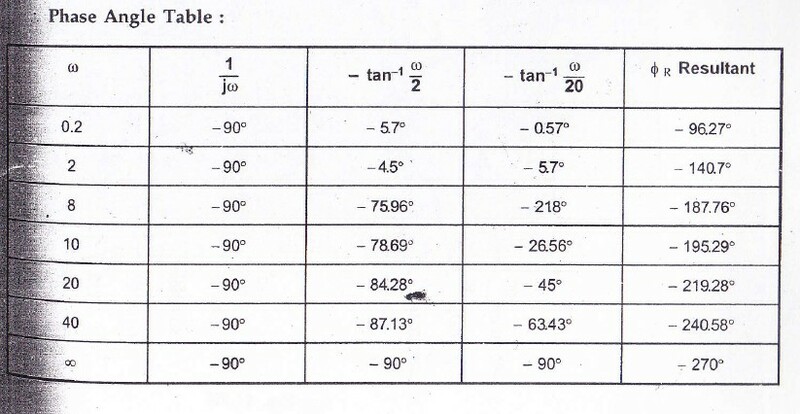 3) Simple pole 1/(1+s/2) with T1 = ½. Hence wc1 = 1/T1 = 2. 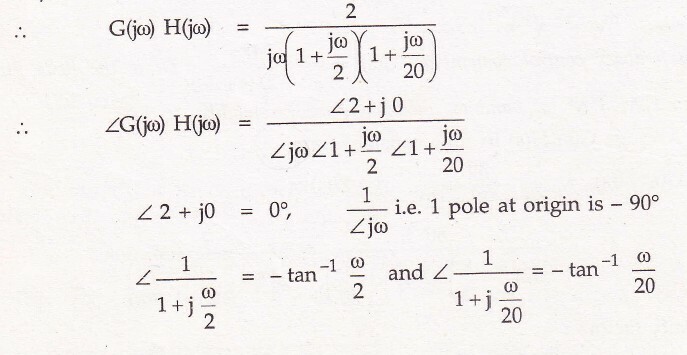 4) Similarly simple pole 1/(1+s/20) with T2 = 1/20. wc2 = 1/T2 = 20. 1) For K=2, draw a line of 20logK = 20log2 = 6 dB. 3) Shift intersection point of w=1 and 0 dB on 20logK line and draw parallel to -20 dB/decade line drawn. This will continue as a resultant of K and 1/s till first corner frequency occurs. i.e. wc2=2. 4) At wc1 = 2, as there is simple pole it will contribute the rate of -20 dB/decade hence resultant slope after wc1 = 2 becomes -20-20=-40 dB/decade. This is addition of K, 1/s and 1/(1+s/2). This will continue till it intersects next corner frequency line i.e. wc2=20. 5) At wc2 = 20, there is simple pole contributing -20dB/ decade and hence resultant slope after wc2=20 becomes -40-20=-60 dB/decade. This is resultant of overall G(s)H(s). i.e. G(jw)H(jw) the final slope is -60dB/decade, as there is no other factor present. To draw straight line of -40 dB/decade and -60 dB/decade from wc1 = 2 and wc2 = 20, draw faint lines of slope -20, -40, -60 dB/decade from intersection point of w=1 and 0 dB line and just draw parallel to them from respective points . How to draw root locus graph with simple steps. Mason’s gain formula for determining overall gain of system (with example). In the last article we have seen block diagram algebra. For studying the complete behavior of the system we should know its transfer function. Using block diagram algebra we can reduce the block diagram of a control system into a single block representing the transfer function of that system. But in case of complicated block diagrams it will become difficult to reduce the block diagram into its equivalent single block having same input and output as that of given control system. So to avoid this complexity of reducing the block diagram we use one simple method. In this method we first construct a signal flow graph of the given system using its ‘describing equations’. And using this signal flow graph and one formula (known as Mason’s gain formula) we can easily find out the overall gain of the given control system. Where x1 is the input variable and x5 is the output variable. 1) In the given set of instruction there are five nodes (x1, x2… x5), therefore mark five nodes as shown in diagram a) as below. 2) Now consider the first equation, in this equation x2 is equal to the sum of four signals having different coefficients. When we connect x1 with x2 the direction should be indicated as (1?2) because of a12, similarly for x2 and x3 the arrow should be in the direction of (3?2) because of a32. The signal flow graph for the first equation is shown in the diagram b). 3) Similarly, we have to follow the same procedure for all remaining equations, which are shown in figure c), d) and e). 4) Finally figure f) shows the complete representation of the signal flow graph of the given control system. Pk represents path gain of kth forward path. ‘?k’ represents the value of ? for that part of the graph which does not touch the kth forward path. ‘T’ is the overall gain of the given control system. In the given signal flow graph x1 is the input variable, whereas x5 is the output variable. 4) Similarly, we have to find all possible combination of three non-touching loops. But in this case there are no such combination exist.